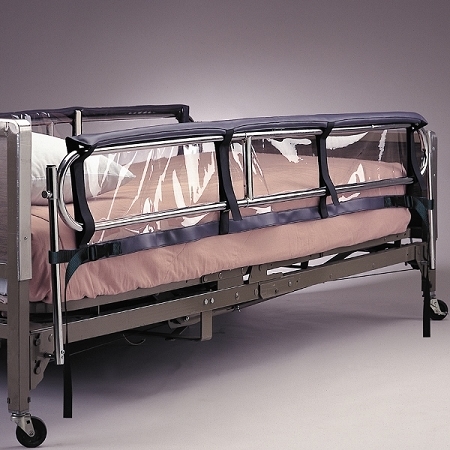 Posey Deluxe Guard Rail Pads are recommended for patients at risk for bed entrapment or injury. Offers maximum bed rail cushioning and coverage. The Posey Deluxe Guard Rail Pads offer maximum bed rail cushioning and coverage for increased bed safety for users at risk for bed entrapment. 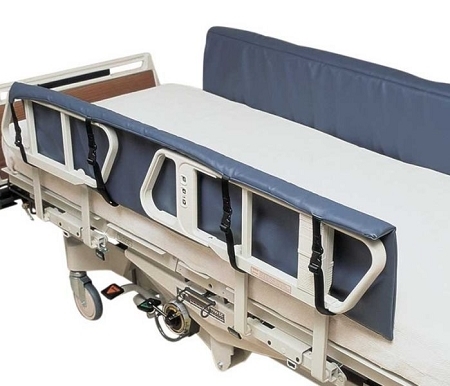 These bed rail pads are available in three sizes to accommodate most healthcare beds. 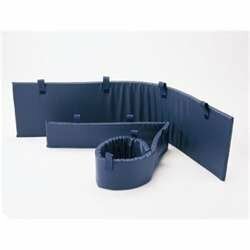 The Posey Deluxe Guard Rail Pads are constructed of durable firm foam with covered with soft, soil-resistant vinyl. Caregivers will find the hook-and-loop fasteners allow the pads to be easily attached or removed. To install the pads, first raise the side rails to the “up” position, then separate the hook and loop straps. Position the side rail pad on the inside of the side rail with the straps facing out, away from the bed. The top strap section should hang over the side rail. Pull each strap tight around the side rail and secure back onto itself. Choose from 3 different size bed safety rail pads. The Posey Deluxe Guard Rail Pad 72 inch length is available with an optional window that runs the entire length of the bed. The window allows caregivers to continuously monitor users. Care: Wipe clean vinyl cover. Materials: Firm foam, covered with soft, soil-resistant vinyl, hook and loop straps. Choose: 60 inch length, 72 inch length, 72 inch length with window.